Why affirmative action failed black families where it matters most | My "Male Side" To Gender Issues. Member of the National Coalition For Men (NCFM.org/ncfm-home/) Since 1985. “The gap in wealth between races has not lessened; it’s grown.” -President Barack Obama, August 28, 2013, tribute speech to Martin Luther King. We’ve all heard about the unintended consequences of government intervention. Hold on to your hat: A program conceived to help the oppressed appears to help the “oppressors” about as much. Who knows — it may lend a hand to more middle- and upper-class white families than to poor black ones. To pay-equity feminists and the mainstream liberal media, who believe white women should be included in affirmative action because of the widely discredited “77 cents to men’s dollar for the same work,” an affirmative-action perspective like the one below may be the most threatening of all perspectives on any topic. Hence it will be ignored — or if not ignored, attacked — by both pay-equity feminists and the mainstream liberal media. How relevant is affirmative action in higher education, if it fails to help blacks narrow the races’ wealth gap? Black Americans have at least one good reason to persist in demanding affirmative action: their wages, which ought to be the true measure of affirmative action’s success — where the rubber meets the road — continue to gain poorly on whites’. Thanks to the myriad mandated affirmative-action programs at public institutions and at employers doing business with or receiving funds from the federal government, and thanks to the voluntary affirmative-action programs of private-sector employers, white women have done quite well. Compare their wage gain from 1985 to 2000 to other groups’. White men’s median wage rose 60 percent, black men’s 65 percent, and black women’s 70 percent: white women came well out on top with a 78 percent gain. White women’s big leap contributed greatly to blacks’ paltry gain on whites. Ideological feminists in particular strongly support the white female’s inclusion in affirmative action. That’s because most of them apparently believe white women experience an oppression similar to blacks’. White women’s oppression, these feminists say, results primarily from white women’s exclusion, like blacks’, from “white men’s” jobs. Moreover, white women generally have been able to find a well-paid husband to about the same degree that white men have been able to find a well-paid job. Via marriage, birth, and inheritance, white women have benefited from white men’s jobs as much as white men themselves. When they divorce, they receive, on average, more child support and alimony than blacks. (The term alimony may provoke cynical laughter among the black women who consider alimony a privilege reserved for white women.) 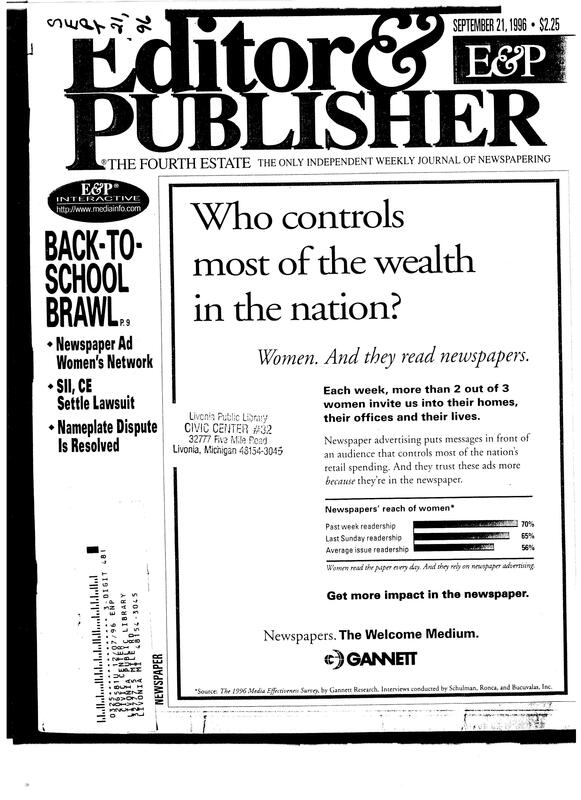 Recognizing women’s economic well-being, an Editor & Publisher (now defunct in print form) front page in 1996 touted: “Who controls most of the wealth in the nation? Women.” The headline was not, of course, talking about black women. Says PBS’s “To the Contrary”: “Women actually control 51.3% of percent wealth in the United States.” Women also control, according to American Demographic, consumer spending by a wide margin in nearly every consumer category. Linking white women to affirmative-action goals has produced an unintended consequence of great irony. Just as most white men share their income and assets with white women, most white women reciprocate with white men. More to the point, they share with them their affirmative action gains. This means, possibly, that by virtue of the huge number of white women assisted by affirmative action, white men are the program’s second biggest beneficiaries, despite however often they as individuals may suffer “reverse discrimination.” For every white man hurt by affirmative action, one or more might be obliquely aided. Perhaps even many of those who are hurt are partially or fully compensated — “through the back door,” some blacks could argue — when affirmative action rewards their wives. On April 26, 2011, Whoopi Goldberg on ABC’s “The View” [four minutes into the video] decried that if anyone actually looks at who benefitted from affirmative action, “it was not black people; it was white women. That is a fact.” It’s too bad that Goldberg apparently didn’t recognize the ironic unintended consequences. Thus, a program that was conceived to help the oppressed appears to help the “oppressors” about as much. Who knows, it may lend a hand to more middle- and upper-class white families than to poor black ones, since a beneficiary’s economic status isn’t, to my knowledge, a qualifying factor. How many times, I wonder, has the wife or daughter of a well-paid white man been boosted by affirmative action into a well-paid job herself — a job that might otherwise have gone to a poor but qualified black American? This perversion of justice may occur often, and it would at least partly explain why, despite the strides of many individual blacks, blacks as a group have economically progressed so little on whites. And at a appalling 1.2 percent progression every 1.5 decades, black households won’t reach wage parity with whites’ for at least 200 years. Which group has affirmative action benefited the least? Which group was originally intended to be the sole beneficiary of affirmative action? Shhh! Don’t talk about this! Clearly affirmative action needs to be jettisoned or retooled. Afterword: A retooling may also be needed for Social Security, which, says historian/economist Thomas Sowell, “is not a racial policy…but economists who have studied it have long described it as a system that transfers money from black men to white women, given the different life expectancies of these two groups.” You can bet a retooling would have been done long ago if Social Security had been shown to be a system that transfers money from white women to black men. “Plight of Black Men Deepens….” at the New York Times. “The Boy Crisis: A Sobering look at the State of our Boys” – TEDx video by Warren Farrell. For an in-depth, scholarly analysis of affirmative action for women, see Chapter 5, “Women’s Rights v. Human Rights: The Case of Entitlements,” in Legalizing Misandry: From Public Shame to Systemic Discrimination Against Men, published April 2006. This entry was posted in Feminism, Gender Politics, Gender Wage Gap, In-depth commentary for the serious activist, Miscellaneous and tagged affirmative action, alimony, black Americans, black men, Camille Paglia, Christopher M. Leporini, Corretta Scott King, Dwayne Wickham, Economic Mobility Project, Editor & Publisher, Leadership Conference on Civil Rights, Legalizing Misandry, Nicholas Kristof, President Obama, Thomas Sowell, Warren Farrell, wealth gap, white women, Whoopi Goldberg, women's 77 cents to men's dollar. Bookmark the permalink. That is one of several reasons I could never buy into the feminist crap my professors threw around at college! Thanks. I think you speak for a very large number of college men. And a decent number of women (I’m female). The current President says one thing but does another. He is clearly pro-feminist as indicated by his support for such organizations as Family Planning, NOW, and an increase in funding to cities with shelters for “battered and abused women”. This administration just as others of the past has done little at all for homeless (or abused) men who make up more than 60 percent of America’s homeless, and much less for children which make up 35 percent of this country’s homeless population. Children by the way are the number one victim of abuse in domestic situations, schools or juvenile justice institutions and by strangers. So what is the agenda of Affirmative Action? The evidence over the last 45 years proves that Affirmative Action has benefited middle class and wealthy white women and other ethnic women for the most part. One has only to look at America’s supposed seats of “higher education” and see that women of all ethnic groups make up the largest populations on college and university campuses. The faculty numbers are soon to follow as hiring policies continue to reflect disparity in recruitment for women over men. Doubtfully any of these “Title 9” type policies do not attempt to balance the scales but to continue the imbalances that wreak havoc on the family and society at large. The voices of so-called minorities in America (especially of Blacks and Indians) have been gagged since the coat-tailing by feminism onto the equal rights for minorities campaigns became part of America’s landscape. Add now the sexual orientation camp and the demand for equal access, equal treatment, and equal rights by Blacks, Indians, Latinos and even Asians gets relegated to a silent whimper. Let us face facts that feminism as an agenda, regardless of who or how it is being pushed, is bent on destruction of the family, with its target being the male, or head of household, regardless of his ethnicity. Indigenous One, very well put. And well written. You added many points that belong in my commentary! Thanks for taking the time to make such a heart-felt statement. So the author is incensed that black males gained 5 percent on white males, while white females gained 8 percent on black females. If you net it out, blacks lost 3 points. Maybe. But since men in general earn more than women, those 8 points are on a smaller base. So it all nets out to a wash. Affirmative action, by the account the author gives, has not shifted the ratio of black to white pay enough to even be sure whether the gap has gone up or down. Affirmative action was intended to help only black men. It has helped white women and white men more. It has not affected the household wealth gap. Thanks, I have an interest in race and gender issues in the nation but had never really looked into this topic. This seems a lot like the common pitfall of “design by committee” (much like congressional bills…) where a truly good idea is proposed, and then other things get glommed into it, and by the time it’s all over, the cause it was designed to help is the one least helped by it. What this article does not address (outside scope), are the consequences of what giving so much more power and presence to women has actually done (in schools and in the workforce) as an unintended consequence. I am against mandatory discrimination of any kind. But if Affirmative Action must exist, it really should be retooled to go back to its roots, no pun intended: for minority men, that’s all. May I call you God for short!? Well said. You can find more such info at ncfm.org. Thanks for taking the time to make a thoughtful comment. Thanks for the ref, I hadn’t seen that site. Looks like a lot of good articles. The graphics are all very bad though. Maybe I should volunteer to help. This is really interesting to me. At the end of 2016 the findings of a study were published regarding prosperity in America.They found that black peoples prosperity had increased but it was a miniscule amount. Hispanics had the most prosperity increase in the country, besided the monopolies, obviously. Quite a bit more than black people. And the results concluded with the prosperity of white americans in America in 2016 as being THE ONLY GROUP WHO LOST PROSPERITY. But they said, its “white” people, so screw them. Not a direct quote but that is exactly what their message/conclusion was. In light of this, I have to wonder if perhaps YOUR data, which seems to omit hispanics completely, hasnt combined the hispanic community WITH the white community?! After all, THAT is a common ploy in government and media data skewing. Hispanic women actually HAVE BEEN the biggest beneficiaries of affirmative action. So I believe your data has convinced you that hispanics are actually white, or that hispanics DONT EXIST. Neither of which is true and I suggest you dig a little deeper. I agree with you that black men are NOT benefitting from affirmative action as much as they could. However trying to conclude that a black mans PAY rate is the victim of white women is a blatant lie! It is well known that the pay scale, across the board in this country, has not risen in MY lifetime! Especially FOR MEN! Women has gone up by a miniscule margin, nothing more. In 45 years! You are just trying to twist this data, which is lacking credibility without the inclusion of hispanics, into an excuse to create hatred and blame for white women. Thats pretty dam pathetic! There IS a war on men going on, but women are not the ones behind it, friend. I encourage you to keep looking for the truth. Unless all you were searching for was AN EXCUSE to spew hatred and BLAME WHITE WOMEN. If so, then mission accomplished. Bravo! Dont you feel studly?! Re: “Unless all you were searching for was AN EXCUSE to spew hatred and BLAME WHITE WOMEN.” I don’t blame white women. I blame liberals (both white women and men) and feminists (both female and male). I merely say white women are the biggest beneficiaries. Re: “Hispanic women actually HAVE BEEN the biggest beneficiaries of affirmative action.” So now I say to you, “All you’re searching for is AN EXCUSE to spew hatred and BLAME HISPANIC WOMEN.” Get it? Do you have a link to a non-partisan source to prove this? Everything I looked at shows white women have been the biggest beneficiaries. Re: “There IS a war on men going on, but women are not the ones behind it” Liberals, the liberal media, and feminists are behind it. I never said women are behind it. Please read more carefully. You’d save us both a lot of time.